Turns out, the ability to switch carriers on the go on the iPad Air 2 and iPad mini 3 may not be as simple as Apple foresaw it. 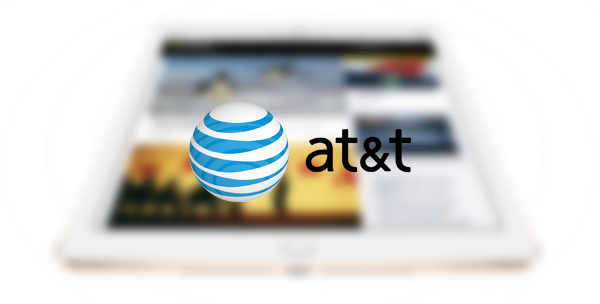 AT&T has announced that it for one will not be playing second fiddle to Apple, and will lock the Apple SIM to the AT&T network once an iPad connects to it. Apple is currently shipping all GSM-enabled iPad Air 2 and iPad mini 3 tablets with the Apple SIM. Unveiling the iPads last week, Apple also mentioned that all new iPads that were GSM enabled would come with the Apple’s own universal SIM card included. 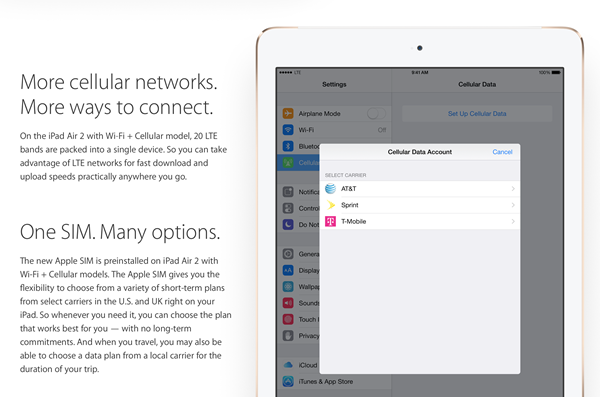 Apple SIM allows users to switch networks on the move, without needing to switch the SIM itself. Apple SIM currently works for the T-Mobile, Sprint and AT&T networks. AT&T however has another plan that – at the chance of a cheap shot – reeks of insecurity. Once you start using the AT&T network on your iPad, the Apple SIM will become so hooked to all those microwaves the carrier sends your way that the Apple SIM will become permanently locked to it. Voila! Your Apple SIM is now an AT&T SIM from Apple. To clear any confusion, Apple SIM card comes included with the new iPads bought from the Apple retail stores only. If you pick up an iPad Air 2 or iPad mini 3 from a carrier itself, the device will come included with that carrier’s legacy SIM card. However, the device itself will not be locked down or anything like that. While the move from AT&T shouldn’t really come as a surprise, AT&T never really bothered explaining the rationale behind this. It is likely that being able to switch carriers would have given consumers the ability to conveniently sample all supported carriers in real-time, and consumers would have been more inclined towards choosing the network that offers that best performance. Clearly, AT&T fears it may not make the cut. All said, universal SIMs from Apple could pose a threat to carrier sales if the said SIM was to be shipped with iPhones as well, compelling consumers to buy the handset from Apple’s own retail stores only. Users will not have to commit to one specific carrier, leading to not just poor sales for the networks themselves, but a decreasing customer base too. While locking down the Apple SIM by AT&T is not going to technically hurt either Apple or iPad users, it is the statement and concern that AT&T intends to show for the introduction of the Apple SIM. The telecom giant believes this to be a clear threat to its business, and who knows, even the industry itself. Wow, What a jerk. Jeez. It’s because AT&T doesn’t re-use their Sim cards. If you need a new Sim card you need to burn one (throw away) and use a new one. And that’s why we greet AT&T with a middle finger and a hearty “FU!”. AT&T sent me an email over the weekend telling me I’ve used too much data (150GB) on my home DSL line. This without ever notifying me that my plan had any limits at all. I’ve been an an AT&T DSL customer for 15 years, which made this even more bizarre. I’m also an AT&T stockholder (long). With 5 minutes of research, I’ve learned that Comcast’s cable DSL (the only alternative here on California’s Central Coast) comes with twice as much monthly Data, 300GB. In addition, Comcast offers speeds of 50 to 100 Mbps, vs. AT&T’s piddly 6 Mbps, AT VERY SIMILAR RATES. I guess they’ve done me a favor, as I’m finished with them, and am awaiting the Comcast installer (desperately hoping for better service than they offered 12 years ago when we switched to satellite for TV). AT&T lost my wireless business just over a year ago due to far better signal with Verizon. These developments have me quite worried about my long stock position, and AT&T’s ability to keep its customers. I guess locking the SIM card is one approach. Better to take care of your long-term customers. Use your mobile phone as a hotspot for Wi-Fi and save money on your iPad, and your mobile bill. You can even start the hotspot on your iPhone directly from your iPad when you need Conectivity on the go. Even those with Android phones can run their iPad using the phone as a hotspot. Why pay an additional monthly device fee, and a lot more for the iPad? Works just as well as that locked SIM card!!! What the suits at ATT desperately need is a good, sound, horse-whipping! For everybody having problems սոⅼοсking THEIR AT&T phones, you are able to check out just google atttiphoneeuunlockingfor great service, it’s the best ՍΝᏞΟᏟΚing site I have ever use, never took us over 6 hours to սոⅼοсking some of my phone.